During the months of December and January crews will be performing cleaning and televising of sewer lines in the areas of Sandhill Road from Clark Road to Roush Road. Please be alert when someone comes to your door asking for entry to your property. From time to time, individuals may pose as a utility worker to gain access. Customers should verify the identification of all utility employees coming to their homes. 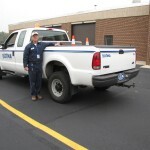 DTMA employees drive distinctively marked vehicles with municipal license plates, wear uniforms and always carry a DTMA photo identification card. Call (717) 566-3237 Ext. 303 when reporting suspicious activities involving DTMA employees or impersonators. Anyone fearing for their safety should call 911.